The French Revolution is a memorable part of history with even more memorable "catch phrases". "Liberty, equality, fraternity", "Off with their Heads" and "It was the best of times, it was the worst of times...". But perhaps the most famous and pertinent line from that wildly confusing and exciting era was said by Marie Antoinette, and went something along the lines of, "Qu'ils mangent de la brioche" or "Let them eat cake". This phrase may have been said when Marie heard the French peasants had no bread to eat. Which begs the question, was Marie really that brazen and uncaring? Maybe she was just stupid and didn't realize that cake was more expensive than bread. Or, could be she was genuinely offering them cake. Or maybe she wanted cake. Whatever her intentions, it was a strange thing to say, although there is no actual proof of this phrase being said. Which then makes me wonder, who actually came up with that phrase? Whoever said it, and wherever it came from, I don't know of they could have expected that the phrase would be so widely used. Though the phrase was originally meant to be rude and uncaring, it has become a phrase used as an excuse to literally eat cake. (Well, if you say so Marie. Guess I have no choice) Does anyone else find this ironic? Now that I have gotten that long peice of boring history off my chest-really, it's been bothering me for some time- it's time to get to the main event. Cake. To tell you the truth, I don't love making cakes. I always find they are never finished, they are hard to transport and there is no definite portion, your slice of cake can be ginormous or super tiny and thin. That doesn't mean I don't like to eat them. Someone give me a fantastic chocolate cake any day! Or coconut lemon, that's my favorite. One of my goals for last year was to learn how to ice a cake properly. This meant that I would actually have to make a few cakes in the process. I don't think anyone actually minded, except my husband who had to carry the whole thing on a pedestool to my mom's house. It weighed close to 7 or 8 pounds! 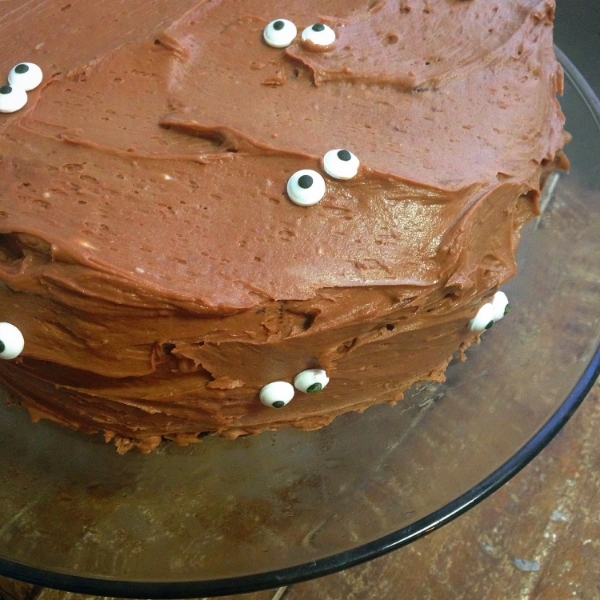 When it came time to slice the cake, the eyes were gone faster than you could say boo. It's kind of like those roses on bakery birthday cakes. You know they taste terrible but you want one, (a whole one mom!) just for yourself. The chocolate cake part was unreal! Soft and rich and chocolatey and perfect! The icing was a little sweet for my taste so if your not a fan of super sweet things, use another buttercream recipe. Don't forget the eyes though! They are so cute I can't even handle it! Preheat the oven to 350ºF. Spray 2 9-inch round baking pans with nonstick cooking spray. Line the bottoms of the pans with parchment paper, then lightly spray the paper with nonstick cooking spray. In a large bowl, whisk together the flour, cocoa powder, baking powder, baking soda and salt. In the bowl of a mixer, mix together the sugar and the butter. Add in the milk, eggs and vanilla, and mix until combined. Add the dry ingredients and mix until combined. Pour in the boiling water and gently mix until combined. The batter will be thin. Let the cakes cool for 10 minutes, then run a knife around the outside of the pan and turn them out onto a cooling rack to cool completely. Remove the parchment paper from the bottoms of the cakes. At this point, you can wrap the cakes in plastic wrap and refrigerate them or freeze them, which will make decorating the cake easier, or you can proceed to assembling the cake as long as they are cooled completely. To make the buttercream, cream the butter in a mixer until smooth and creamy. Add in the powdered sugar, a little at a time, until fully incorporated. Mix in the Nutella, vanilla and salt and beat until light and fluffy. Add as much cream as needed to make the frosting a spreading consistency. To assemble the cake: Level each of the cake layers, reserving the scraps. Place one layer on a cake stand or serving plate. Top with some of the buttercream and spread in an even layer to the edged. Top with another cake layer, then more buttercream. Repeat with another cake layer, more buttercream, and then the final cake layer. Spread a thin layer of frosting over the outside of the cake. Refrigerate the cake for 10-15 minutes. While the cake is in the refrigerator, take the reserved scraps of cake and crumble them as best as you can. The cake is very moist, so if the scraps aren’t crumbling, you can put them on a baking sheet and place them in a 250ºF oven to dry them out a bit, which will help. Use the remainder of the frosting to go over the cake, making sure it is covered evenly. Take the cake crumbs and gently press them into the outside of the cake. Press sets of two candy eyes randomly around the cake.